Heading off on vacation is often the culmination of months of planning and saving for your travel budget. It's the one time of year when we really get to relax, let our hair down, and enjoy the freedom of being away from work. So why risk wasting all that effort by allowing an unexpected bout of sickness to ruin it? 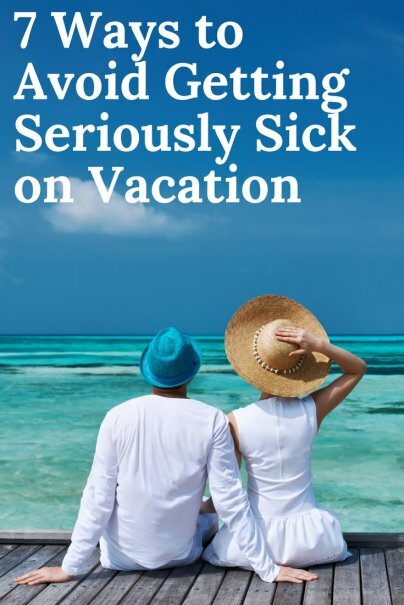 Health dangers are part of nearly every trip, but with proper precautions before and during your travels, it's entirely possible to avoid getting sick on vacation. Your number one priority when heading off on an international vacation should be making sure that you are protected from diseases. First, double check that you are up to date on your routine vaccinations, such as those for Tetanus-Diphtheria-Pertussis (Tdap) and Measles-Mumps-Rubella (MMR), which may require a booster. Then you need to figure out what jabs are necessary for whichever country or countries you are planning to visit. The best way to do this is to make an appointment with your health care provider or a specialized travel clinic, which should be able to advise you on exactly what you need. It's important to leave yourself plenty of time, as some of the shots, such as the vaccination against cholera, require two doses. Also make sure you check if there is any medication you need to take while you are traveling, such as anti-malaria tablets. It's far better to be safe than sorry. You don't want to ruin your vacation before it's even begun by arriving at your destination feeling out of sorts, so it's important to make sure you're properly prepared. Long plane journeys are renowned for having a detrimental impact on your health, but even short flights could be hazardous. The effects of air travel on the body range from dehydration and restlessness, to the potentially fatal deep vein thrombosis. Do your best to make sure that you are fully rested in the days leading up to your flight. Consider boosting your immune system by taking some multivitamins, eating healthily the week beforehand, and ensuring that you are fully hydrated when you board the plane. However tempting it may be, particularly if you're a nervous flyer, stay away from the airport bar, as the combination of alcohol and altitude may undo all of your preparation. Regardless of your destination, avoiding the local tap water is always a good idea when you go on vacation. There are many locations around the world where it's unsafe to drink the tap water, but even in the countries where it is technically safe, the water may still upset your stomach. This is due to the different balance of minerals and chemicals in the local water, as well as the different purification methods used. Washing your hands thoroughly with soap and water is the most effective way to clean them. This is because it gets rid of dirt that may be harboring germs, and kills the germs themselves. But there isn't always a ready supply of water and soap for this to be a practical option. In these cases, hand sanitizing gel or antibacterial spray is the secret weapon of the savvy vacationer. When used properly, these products kill over 99 percent of bacteria. Be aware of where you eat and the establishment's hygiene standards, whether it's a hotel restaurant, or a local street food stall. Food poisoning indiscriminately affects anywhere that has poor practices. To steer clear of food that will make you ill, always make sure it's freshly prepared and piping hot, avoid raw food, and don't eat anything prepared with tap water that isn't boiled. A great way to get the lowdown is to ask around for recommendations on which places are good, or do some research online. Despite their diminutive size, mosquitoes are some of the most dangerous creatures on the planet. At best, they'll give you an annoying bite that will lead to a lot of itching and discomfort, or even a fever, which in itself could ruin your vacation. At worst, depending on where you're going, you could end up with any one of a long list of nasty diseases that could be threatening to your health. The only way to completely stop any risk is to not get bitten, so if you're going to a mosquito-heavy area, take plenty of tried and tested repellent, cover up areas of exposed skin, and always sleep under a mosquito net. One of the pleasures for many travelers heading overseas is the opportunity to spend some time catching a few rays. But too much fun in the sun can have seriously negative effects on your health. The most common of these is sunburn, but more serious illnesses such as heat exhaustion and heat stroke aren't to be taken lightly. In extreme instances, they can even lead to death.